A Spiralizer is my favorite kitchen tool to put a healthier, naturally gluten-free spin on pasta classics. A Spiralizer transforms vegetables into curly noodles. With several different blades, a Spiralizer slices vegetables (and fruit) into noodles of different thickness, from spaghetti to pappardelle. If you don't have a spiralizer tool, you can use a julienne peeler instead to create spaghetti-like vegetable noodles. This recipe features zucchini noodles tossed raw in a bright and savory dressing of lemon juice, garlic, and tahini. The dressing softens the zucchini noodles as it sits, so there is no need to cook the zucchini noodles for this meal. The pile of zucchini noodles is topped with grilled chicken, cherry tomatoes, Feta crumbles, and chopped fresh parsley. Dairy-free? Simply omit the Feta crumbles, or use a dairy-free cheese instead. Instead of grilled chicken, you can pair this recipe with grilled shrimp or salmon instead. Vegetarian? Replace the chicken with grilled tofu steaks or portobello mushrooms. Prepare Tahini Lemon Dressing: In a food processor, pulse garlic cloves a few times until minced. Add the lemon juice, tahini, fresh parsley leaves, water, and olive oil. Pulse until smooth. Season with salt and pepper to taste. Set aside. Wash and trim off the tough ends from each zucchini. With a spiralizer kitchen tool, spiralize the zucchini one at a time into spaghetti sized-noodles. Don't have a spiralizer? Use a julienne peeler, vegetable peeler, or sharp knife instead. Place zucchini noodles in a large bowl. Pour half the dressing and toss to coat. Add more dressing, if needed. Let sit for 10-15 minutes to soften the noodles. 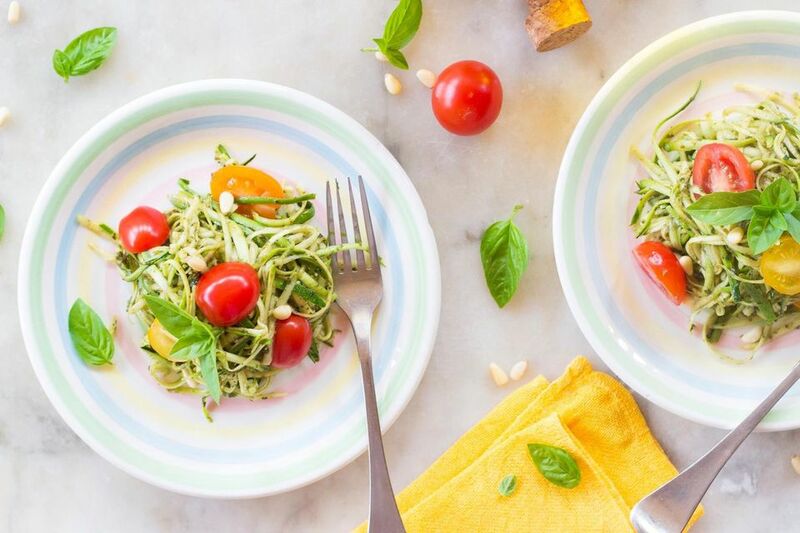 Divide the dressed zucchini noodles and sliced cherry tomatoes into two bowls. Place slices of grilled chicken over top. Garnish with Feta crumbles, if desired, and additional Tahini Lemon dressing and chopped parsley. Reminder: Always make sure your work surfaces, utensils, pans and tools are free of gluten. Always read product labels to confirm the product is gluten-free. Manufacturers can change product formulations without notice. When in doubt, do not buy or use a product before contacting the manufacturer for verification that the product is free of gluten.